Yuri Elkaim is the founder and professor of Super Nutrition Academy. An inspiring and "No BS" nutrition and fitness expert, Yuri holds degrees high honours degrees in holistic nutrition and physical education and health/kinesiology. For more than 13 years, his work has helped more than 100,000 people worldwide lose weight, get in great shape, eat healthier, and have a much better understanding of their health. He's on a mission to transform the lives of more than 10 million people by 2018. He is also the author of Eating for Energy and the Total Wellness Cleanse, and the creator of more than 130 workout programs, including Fitter U, Fitter U Fitness, Amazing Abs Solution, and Treadmill Trainer. For 7 seasons, Yuri also acted as the head strength & conditioning and nutrition coach for the men's soccer program at the University of Toronto. Prior to that, he enjoyed a 3-year pro soccer career in both Canada and France. Yuri and his programs been featured across the nation's media including Breakfast Television, Perfect Fit, A-Channel Morning, CTV news, e-Talk Daily, Global News. 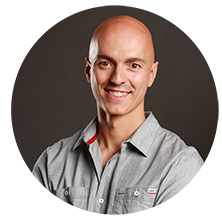 He's also a frequent contributor to numerous magazines including Maximum Fitness, VIVA, Impact magazine, Wish, and Fitness Business Canada - just to name a few.